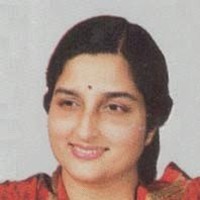 Anuradha Paudwal (Marathi: अनुराधा पौडवाल) is a popular playback singer in Bollywood in India. She has sung songs in Hindi and Marathi. She studied at Xavier's College in Mumbai. She was married to the late Arun Paudwal, who worked with music director S. D. Burman as his assistant. Her singing career started in 1973 with the movie, Abhimaan, (starring Amitabh Bachchan and Jaya Bachchan) in which she sang a Shloka (a Sanskrit verse). In the same year she also made her Marathi film debut with "Yashoda" (music by Datta Davjekar). In 1974, she brought out a record of Non-film Marathi songs or "bhav geeten" which became very popular. In 1976, she got her break as a playback singer in Hindi films with Kalicharan(starring Shatrugan Sinha and Reena Roy). Her first solo was in the movie, Aap Beeti, (starring Hema Malini and Shashi Kapoor). Laxmikant-Pyarelal were the music-composer duo for that movie. She also occasionally sang songs for composers Rajesh Roshan (Des Pardes), Jaidev (Dooriyan, Laila Majnu), Kalyanji-Anandji (Kalaakar, Vidhataa), and Usha Khanna (Souten, Sajan Bina Suhagan).